Jennifer Lawrence offers her heart in the poster for Darren Aronofsky’s Mother! 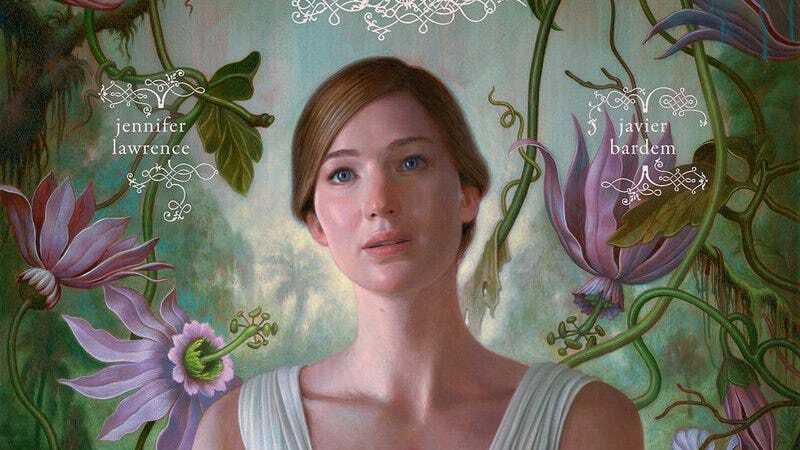 The plot of Mother!, the upcoming Darren Aronofsky movie starring Jennifer Lawrence, is still largely unknown, but over the weekend, the project got a gorgeous yet supremely creepy poster. Released on Mother’s Day, the illustration shows Lawrence with a glazed expression and her heart ripped from her body. She holds it out as blood runs down her hands. The font is gothic, but the backdrop is floral, and it all adds up to something deeply unsettling. (Peer closer and you might find secrets in the flowers.) The Wrap reported back in March that the film is a “horror-thriller” along the lines of Aronofsky’s Black Swan. It also stars Javier Bardem, Michelle Pfeiffer, and Domhnall Gleeson and involves ”uninvited guests” showing up at a couple’s home.